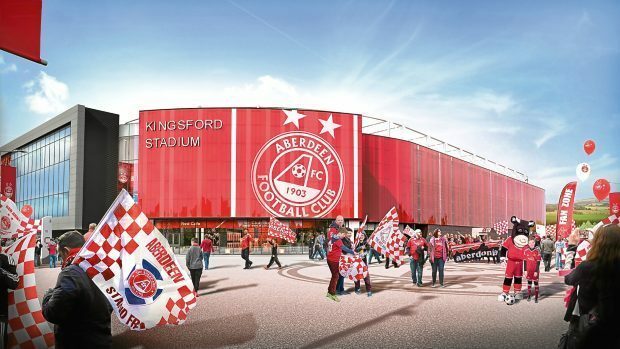 A final decision on Aberdeen FC’s £50million new stadium plans will be made at a special council meeting in January, it emerged yesterday. Senior sources confirmed the plan last night for the special Monday meeting which will be held on January 29. The ambitious plans for a new stadium and training facilities at the site between Kingsford and Westhill has become a battleground since they were first unveiled. The grassroots No to Kingsford campaign group has challenged claims of the economic benefits the plan would bring and opposed the development citing a loss of greenbelt land and a surge of traffic in the area. But the Dons have argued that the plan is the only way to make sure the club remains competitive, insisting that there were no other suitable sites to build on. A pre-determination hearing will be held on January 17 giving councillors the chance to focus on new information recently provided by the football club. Last night AFC chairman Stewart Milne said the club was “very pleased” a decision would be made by the end of January. “The recent report from the economic development department at the council backs up our additional detail and analysis and there is now no doubt about the overall economic benefits to the city and wider region associated with our ambitious plans for Kingsford. “Derek McInnes’ decision to remain at the club is not only a major signal of confidence in AFC but also in Aberdeen itself and, with our return to winning ways, we must now reward this success by getting on with delivering the facilities our club so badly needs. “The latest information in our planning application underlines that there is no other site available or deliverable.